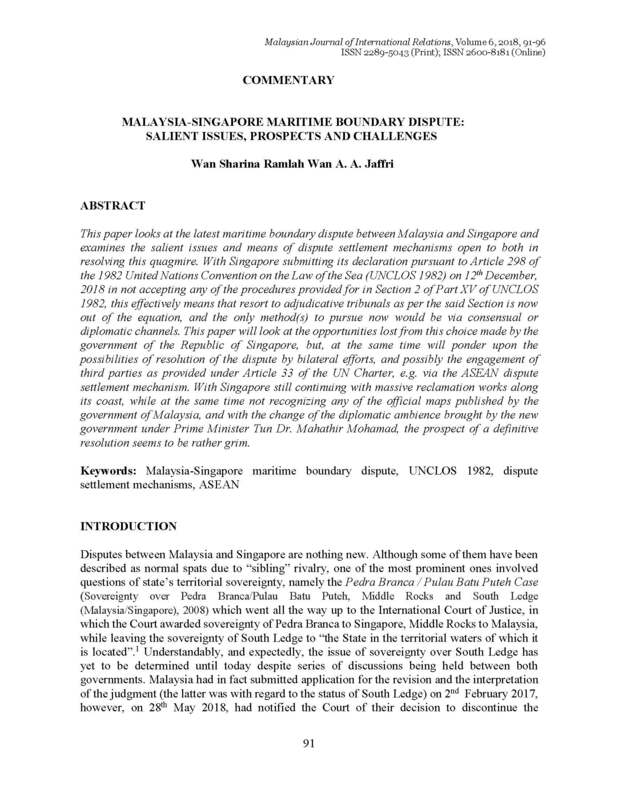 This paper looks at the latest maritime boundary dispute between Malaysia and Singapore and examines the salient issues and means of dispute settlement mechanisms open to both in resolving this quagmire. With Singapore submitting its declaration pursuant to Article 298 of the 1982 United Nations Convention on the Law of the Sea (UNCLOS 1982) on 12th December 2018 in not accepting any of the procedures provided for in Section 2 of Part XV of UNCLOS 1982, this effectively means that resort to adjudicative tribunals as per the said Section is now out of the equation, and the only method(s) to pursue now would be via consensual or diplomatic channels. This paper will look at the opportunities lost from this choice made by the government of the Republic of Singapore, but, at the same time will ponder upon the possibilities of resolution of the dispute by bilateral efforts, and possibly the engagement of third parties as provided under Article 33 of the UN Charter, e.g. via the ASEAN dispute settlement mechanism. With Singapore still continuing with massive reclamation works along its coast, while at the same time not recognizing any of the official maps published by the government of Malaysia, and with the change of the diplomatic ambience brought by the new government under Prime Minister Tun Dr. Mahathir Mohamad, the prospect of a definitive resolution seems to be rather grim. WAN A. A. JAFFRI, Wan Sharina Ramlah. Malaysia-Singapore Maritime Boundary Dispute: Salient Issues, Prospects and Challenges. MJIR | Malaysian Journal of International Relations, [S.l. ], v. 6, p. 91-96, dec. 2018. ISSN 2600-8181. Available at: <https://mjir.um.edu.my/article/view/16654>. Date accessed: 26 apr. 2019. doi: https://doi.org/10.22452/mjir.vol6no1.8.